I spent the better part of the last 2 days doing my coursework. It's fun but labor intensive. I did save the lessons so that I can refer to it later. I'm also itching to do some spring cleaning but class is on a time table here. I will probably take another class but I'm thinking I might skip the next session. I certainly will not take 2 classes at the same time again. DH and I are going to dinner and to see a blues musical group tonight. I'm not crazy about this style of music, doing it more for DH's benefit (I just KNOW he would not do the same for me and go to Green Bay to see Barry Manilow ;) ;) ;) :lol: - I guess this means I love him more :rofl: I did get a response regarding volunteering at the theater but it went to my spam box. Too late to volunteer tonight - free admission to the show as well as a soft drink and bag of popcorn for my troubles ;) I'll take a look around tonight and give it a bit more thought. Thanks for the suggestion about the rubber boots. Some of them are really cute but it seems like they are so hard to get on and off. I can't bend and twist like I once did. Annie - well you certainly have attacked the to-do list today. Good planning so that you can enjoy tomorrow's warmth outside. I will take any nice weather you can spare ;) So glad to hear your blood sugar numbers came back fine. With a family history, you have to be mindful even if everything else seems in order. About the only canned stuff I buy is beans for soup - chickpeas, black beans or great northerns - yes I can cook the hard ones but they take so long. I also have a can or two of green beans because I love them cooked up with fresh tomatoes, onions and bell peppers. I have tried it with fresh beans but for some reason, this side dish is comfort foods and I like it better with the texture of the canned beans. Go figure. :dizzy: Other than that it's fresh or frozen all the way for me. I can totally see you singing all the tv theme songs. :lol: I will have to get you the 101 tv theme songs CD as a wedding present. Then I will have to borrow it because it's the only CD that has the original version of Sesame Street on it (sunny day, chasin' the clouds away). I was already grown when Sesame Street came out but I loved that catchy song. That and the Banana Splits theme. Are you getting ready for the wedding? What's the plans? How's the weather looking in Florida? Hmmm, maybe not swimming weather but nice and sunny and in the 70's - bring a sweater for strolling on the beach at night. Michelle - so now you are considering the LA area??? Ick -sorry for the editorial comment. I can totally understand the appeal of SF or SD but there isn't enough money to be had for me to go to LA. But it's not me, it's you after all. Glad you are getting along well with the roomie. I take it that her dog has recovered as best as it can. Enjoy your workshop tonight. Mel - sorry to hear about Jen, hope she will be alright. Poor girl has no padding to protect her. I would certainly donate if I could... Also sorry to hear about the NS. Many of those plans use alot of soy as a protein source. Soy is not good for hypothyroid so it was never an option for me. I hope you can do well on TJs food - although I think they sneak in more of the tasty bits than NS. Guess it's back to cooking your own stuff too. Can't you qualify for some meals on wheels sort of nutritional plan? If I was out there I'd cook for all of us - Mom too - would probably do us all a bit of good. Those pretty pink boots are far too nice to muck in the mud. I'd just have to sit on the deck, put my feet up and look pretty ;) Will have to wait until DH gets better so he can go out and do all the work while I sit there and have tea. :rofl: How is your knee feeling? Ice packs all around for you and Jen. Laura - not sure if you said your group was reading How to Be A Woman but I picked it up from the library the other day. Hated it. Read the first couple of chapters but I just thought it was gross. I can see where 20 somethings and fans of Chelsea Handler type of humor would like it. Can't see how they compare her to Tina Fey. Hopefully your circuit class today will stretch and pull things out in preparation for Sunday's next go with the kettlebells. Good luck with that - hope the trainer brings in a lighter set. I'd be so nervous that I'd forget I was holding on to the things and would let go and launch it in the air. :rofl: Since you like to ride your bike how do you feel about spin classes? Ceejay are you on the road again this weekend or just staying in and figuring out the new tablet? Annie - I just love all your energy! Good for you for being so productive this weekend! I'll bet you're so excited for your wedding and honeymoon! I'm so very happy for you, sista! Shad - So sorry to hear about your knee. I hope you can manage the circuit and avoid stairs. Good on ya for swimming. Happy - I'm not considering LA. Admittedly, I've done a couple phone interviews for jobs there, but it's not top of my list. I'm focusing on the San Diego area and the San Jose area (also called Silicon Valley). I'm not sure I'd like to live in San Francisco as I really don't know anyone there. So when I say the SF Bay Area, I really mean the South SF Bay Area (which would be in and around San Jose, and other cities near there). LA doesn't hold a lot of appeal for me...but if it gets to be late June or July and I'm still living here in WI, then I'll be less choosey. Time to work on my online portfolio. Your comment about moving to warmer weather made me smile about something. Back in 2001 or so I worked with a sweet girl who relocated to Chicago from NYC for work when the moved the corporate office. Nicole came into town in the autumn and by October it started to snow. And snow. By December we had the snowiest December on record. Now being from NY Nicole was no stranger to winter but even this was alot of snow for her. She tried really hard to make a go of it here but she missed her boyfriend (later to be her husband) and was having a horrid time trying to make ends meet on an admin's salary - even with a roommate. In the end, love and loneliness won out and she returned back east in January. Darned if we didn't get a lick of snow after that - well barely - and NY had the snowiest January on record :rofl: We said that was proof positive that the snow followed Nicole and we called her the snow queen after that :queen: :lol: So... if you get to CA and take the cold with you, just sayin' we wouldn't mind ;) :lol: Sorry the interview didn't go so well but at least you are getting nibbles. Each one helps hone the interview process more. Sunday, blessed Sunday and this morning I got out for a walk. Didn't bother to try and run or to climb stairs. Did about 1.5k and everything went okay. I'm just waiting for the kids to get out of the pool and I will go down and try to get another 20 laps in. I've been sorting out the menu to try and get everything eaten before I go home for the Medical break. Should just about do it. Doubt that I will have to go shopping again. I'll just eat out the freezer and the pantry although there may be a need for some fresh veg at the end of the week. Talking about fresh veg, the market was fairly cheap on Saturday but I wandered into the local supermarket today to get some stuff to make sushi for lunches and for a meal for tomorrow. Thought I might like some green beans - until I saw the price on the shelf. After that I went up and down the produce aisle and quite frankly, they are ripping people off. It is all very well to say that it costs to get stuff to far away Darwin but that is ridiculous. $4.95 for a pound of beans???? Whaddarya? Happy - wondered whether taking several classes at a time might prove too much. Maybe I won't retire, seems like everyone gets real busy about then. What with you and Ruthxxx I think I might work on. Had to laugh at the DH hollering at the deer. Did they take any notice of him??? I think not. Michelle - you seem to be getting plenty of nibbles on the jobs. Hope something comes up shortly which is more to your talents. My DS1 had similar trouble in the UK (no that is not in the States Happy) when he went to London. DS1 has a B.I.T degree with a broad spectrum of knowledge of all sorts of programming, system admin, etc. but not an in depth knowledge. IN NZ and Aus, we tend to learn bits of everything and have the ability to cross over into many areas. Over there they tend to specialise instead of spanning several areas so he found it hard to get work. He could have done many of the jobs he interviewed for standing on his head, but they wanted specifics. Anyway, it will all pan out eventually. Annie - keep cleaning. If you carry on moving west with the broom, then turn south you will end up at my place - still sweeping. Yes I am going back to the h*ll hole for a short period of time, only because there is not much else of interest out there and the training school is not yet a reality. Like Michelle, something will pop up eventually. I'm actually going upstairs to set up the help desk - or should that be the no help desk. Really, I can't fathom what they are doing up there, they surely are not providing help anyway. Not even the basic stuff. Mel - should get Jen over here. She is banged up, so is my knee. We can sit in the pool and moan about our aches and pains together while Richie barbeques up a storm. He can have a swim after he has done the feast and cleaned up after himself. Laura - Hope you have knocked yourself out with the kettle thingy. Glad to hear the pizza went down a treat. Love a good pizza. Ceejay - A tablet or an I-pad??? You should get a fair amount of use out of that. Okay - sounds like the kids are exiting the pool. I need to get into it although I must confess to not feeling tremendously enthusiastic - not because of the swimming bit, but because I hate it when I go down there and some one comes in after me. I like to be ALONE in the pool. I guess I don't share too well. The photos are some I took this morning on my walk. The Chinese Temple is across the road from my apartment and the statue is one of the 8 immortals - the only woman - Benton. She brings the luck apparently. I have a miniature of her at home that I bought from the British Museum last time I went over with Chris. I THOUGHT WE WERE DONE WITH THE SNOW BUT OUR SISTERS KEEP GETTING BOMBARDED. NOTHING NEW HERE AT ALL. JUST DID SOME COOKING YESTERDAY AND SORTING. RICHIE DID SOME SHOPPING. JEN LOUNGED AROUND. IT'S COLD HERE AGAIN...FOR ME... SO I STAYED UPSTAIRS. THE WASH CAN BEGIN AGAIN NEXT WEEK. SHAD....I HOPE THE SWIMMING KEEPS HELPING THE KNEE. BET YOU WILL BE GLAD TO GET HOME AGAIN AND REST THAT KNEE. PIRCES OF PRODUCE IS RIDICULOUS. WE BUY A LOT OF FROZEN. IT'S CHEAPER AT TJ's STORE. I LOVE YOUR PICTURES. MUST HAVE BEEN A GREAT WALK. MICHELLE...HOPE THE INTERVIEWS GO WELL. TAKE YOUR TIME AND MAKE THE RIGHT CHOICES. I AM GLAD THE ROOMMATE WORKED OUT SO WELL FOR BOTH OF YOU. JUST KEEP DREAMING OF SNOW-FREE CA!! HAPPY....HOPE YOU GUYS HAD A GREAT TIME OUT WITH THE MUSIC. JUST WHAT THE DR ORDERED...A GOOD TIME!! I AGREE ON THE BOOTS. THEY'RE FOR SHOWING NOT WORKING! TEA ON THE PORCH SOUNDS LOVELY! I GUESS MR BEAR CAN SLEEP ANOTHER WEEK OR SO. EXPECIALLY IF IT KEEPS SNOWING!!! MEALS ON WHEELS IS NOT GREAT IN MY AREA. SOMETIMES THE FOOD THEY SERVE DOWNSTAIRS SMELLS "OUT OF DATE". YUCK!! I REALLY DON'T KNOW HOW THE SENIORS AREN'T ALL SICK. I'LL JUST KEEP GETTING HEAT & EAT STUFF FORM THE STORES. ANNIE....HAVE YOU STOPPED YET FOR A BREATH OF AIR?? YOU HAD A LOT SCHEDULED FOR JUST ONE DAY. AFTER YOU'RE DONE WITH SHADDIE'S PLACE YOU CAN COME HERE. Hi all back from my very short trip to Jonesboro. Was going to pick up a peace of furniture. but they keep the lay-a-ways in a different location. I will pick it up in a couple of weeks. Came home yesterday and mowed the lawn. I'd bought a heavy duty cord and that helped. I was stiff afterwards though. But it was good for me to get outside in the sunshine and fresh air. So far the allergies are behaving. I would have gone with dh to hear the blues. I like all kinds of music. And I would have gone with you to hear Barry Manilow. Glad you didn't try to clear all that snow by yourself. You are taking two time consuming courses for sure. Hope Jen is feeling better. Can't blame you for giving up on NS especially if it's causing problems. I wish I had all your energy. I'm getting things uncluttered, but still have a way to go. I thought about a scrap book or photo album. But my sister and her family have the same pictures. That's another hard choice for me to do. 1.5 miles on a sore knee is excellent. It's like I told my sis I do what my body allows me to do. One box at a time is a good goal for emptying those boxes. That's mainly what I'm doing a little at a time. but this week end I felt more accomplished. I had to get rid of some small appliances that was given to me as gifts which was hard but I've never used them and taking up space. I'm still not through but getting there. Even got rid of a couple of plastic containers in the shed. Now for the biggy, Mom's big box of stuff. I'm not in the mood to work this morning but that's okay too. Morning all. Sun's out, so that's nice. Yesterday started off gloomy and we got a wee bit of snow flurries early, but then it quit, but it stayed chilly and windy, in the 40's here. Today's supposed to get to 70, that'll be nice. Mel - Sorry the NS has got stuff that isn't working for you. Back to what you know doesn't bother you. Ouch re Jen's fall. Wish her a speedy recovery from me. :hug: Cute boots, but I just can't see myself in them. The kettlebells aren't dangerous, we're not doing anything crazy with them - some moves you switch the bell between hands, but that's about the fanciest move. Annie - Busy weekend schedule for you as usual. Yeh, today would be a good idea to get out and do some yardwork. It'll have to be light for me as I my k'bell class has sapped some energy, and I have to save some for the dog walk. LOL re Sassy - no walking for her. Now I know why they actually sell doggy strollers!! The pup next door greeted bf and I with the usual puppy silliness and rowdiness when he was going out for a walk yesterday just as bf and I got back home from lunch, but once the actual walk began, he was walking very nicely - who knew??!! Anyway, I think my yardwork will consist of sprinkling Preen on the rest of the garden beds now that I bought some more. Countdown now...4 days, right?? Shad - Sorry you really banged up the knee. Glad you took a good walk without any problem, and I hope you got to get in a nice, solitary swim. Wow, is that expensive for produce! We eat our share of frozen, but try to limit the canned stuff to beans that we use for soups, chili, etc. Luckily we have a produce market in the area that has pretty decent prices. Thanks for the photos! Ceejay - If we keep nibbling away at the boxes, bins and clutter, eventually noticeable progress will be made!! We can do it!! Bf has replaced the cord a couple times on our mower - just doesn't hold up to the repeated pulling over the years. I expect our mower will need to replaced in the near future. We've had it since we moved in 13 years ago. Oops, now it's not morning anymore. Took me a while to catch up on all your posts. I made two batches of brownies - one with pecans, and one "nutless" as bf called them. Tasty. Also did two loads of laundry and a dog walk. Tried to take a short nap before book club, but it didn't work. Book club was alright, some good discussion about the book too, lol. However...I ate too much at book club, and the before and after eating that day wasn't all that good either. Oh well, one day isn't going to wreck my efforts. I watched the rest of a MOTG episode, and then the next one before finally getting to bed. I was up relatively early this morning, so I will probably start to fade early today, and I better get to bed early if I know what's good for me!! Kettlebell class was good - better warmup this morning, so hope that helps with soreness. Still very challenging for me, especially when we get to some very challenging plank moves in the 2nd half of class after I'm already very tired. Psychologically I also think moving to the mat has always meant easier exercises, but NOPE!!! Have to get that out of my head, yesterday's class was also challenging on the mat too! Still, I do want to get something accomplished today, so it's time to get in the shower (yes, I took a rest post-class again) and get crackin' with perhaps another load of laundry, thaw something for dinner - perhaps something that can be grilled, get out in the yard and Preen :lol: walk doggy and who knows what else. Hi all, started this in the morning but then like Laura, somehow the day got away from me. Last night we went to see a band at the Theater. They were decent enough, not a group I'd go see again but it was a nice evening out. We went to dinner at a local restaurant we frequent. I had baked haddock, DH had the fried fish fry. Both were really tasty and we got fifteen percent off our bill by showing our theater tickets (their way of supporting the arts). That was a nice surprise. I think I'd fit right in. Since we are going to another show next week and the week after we have plans, I might volunteer to be the wine-tender or whatever they need come May. We didn't want to be late to the show so we went to the restaurant early and got served quickly so we had some time to kill ahead of time. Got to the theater 30 minutes before the show and picked out our good seats. Now this was once an old movie theater so think old theater seats. I was sitting on the end and the seat in the row in front of me was removed so I was able to stretch my legs out. My purse was on the floor next to my legs. DH was next to me of course. We were sitting and talking when a tall man came bounding up the aisle and said "hey lady watch your purse!". I started laughing as I knew there was no danger there but asked "why?" and smiled. He said because there are MUSICIANS up on stage. :rofl: Everyone grinned. We enjoyed the first half of the show - the one guitarist was really, really good. At the intermission I went to get us a drink and when I came back I noticed this greasy looking guy looking at me oddly. I immediately named him Squiggy from the character from the TV show Lavergne and Shirley. He looked like Squiggy's blond brother. Greased back hair, leather jacket and kind of goofy looking. I told DH to watch my purse when I got up to go for refreshments. As I came back and sat down he came very close to me and proceeded down the aisle to talk to some people. Then he came back again and gave me the stink eye. Don't know what was going on with that but eventually the second set started and we all settled down to watch the show. It's snow like mad again out there. *sigh* Another storm made it's way here and we are just on the edge of the ice and snow. Ferocious blizzard out there. DH put out only 1 bucket of corn and the 3 amigas as we call them (Mom and her 1 and 2 year old kids) are out there eating it up. The snow is accumulating fast on their coats. Looks like we are going to get some ice up here in a couple of hours. I hope not. So done with winter. Ceejay - did not know you liked a lot of music. We went on Beale street a couple of times over the summers but I hear it's not safe to be down there any more, even in the summer. That's a pain that you took a trip for nothing with the furniture. That's great to hear that your allergies are staying in check. Are you taking meds on a regular basis as a preventative? Shad - holy geez that is highway robbery for the produce :yikes: I guess I'd be getting canned things. I take it there are not to many places to shop so that also keeps the prices high. As for the classes I didn't think there would be so much in the way of exercises. Also you have to think some things through and mull over an idea so it's not like you sit down and knock things out in an hour. I won't be taking 2 classes again. As for being busy, I suppose it would be no different for you when you retire. You are not one to sit in a chair and knit blankets so I'm thinking you'd have your fingers in many things also. Or would be travelling about. It's just nice (and I'm grateful) to be able to pick things that are of a modest cost and do what I WANT to do. Some things like volunteering - you are doing for free on your own time - so if things don't go the way that you like, there's no guilt in turning in your apron and walking away. And one certainly does not have to put up with the politics and silliness in the office which makes it all the more lovely. And I'm not wasting half my life sitting in boring meetings, listening to people pontificate their idiot concepts or being stressed out on the road in a commute. The only thing I miss is the money and I've come to find that I don't really even miss that - I am quite happy with what I have for the most part. As for the Help(less) desk, all I can say is that after 7 years of managing one, we were always the poor orphans. Like training, budget money always went to the other teams, we were expected to work miracles with precious little to work with and little to no training from the implementers. I wish the upper echelon would be more supportive of those providing support. The snow is really piling up. This one is going to need to be shoveled. :mad: The trees are totally covered and it's building up on the deck and cement. I have 2 wine bottles out on the deck on the utility cart chilling nicely. A Riesling and another white they are billing as reminiscent of Angel Food cake. How many wine glasses shall I set out for you ladies? I'm sure I can come up with some nice appetizers too. Annie - it is storming like the dickens down in FL this weekend. I hope it squeezes every drop out of it's system so that you have a bright and sunny holiday. I don't know if the weather we are having now is tracking north or drifting east over by you. Hope you are not planning on sandals for the wedding. Or at least have a pair of closed toe heels for plan B.
Michelle - hope you are enjoying some relaxing time today. Good luck on your interviews! 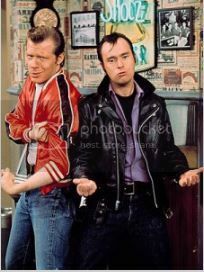 I remember Squiggy. Maybe the guy was watching your purse. Yep, I love all kinds of music, jazz, blues, country, classical, some rock, mainly that of the 60's, 70's and 80 era. And of course Elvis then the Beatles. Sounds like those positions would be easy enough. I'm really getting bored now. Still have an hour to go home. Have thd Golden Girls on in the back ground. This morning I watched rerun's of the Danny Thomas show. I laughed. For some reason my screen has gone pink. Quick Post. Not Even Sure If I Said Anything About This. I Was So Sick After It Happened I Tried To Put It Out Of My Mind. I Had A Big Fight With The Wh.chair People On The Phone Friday. They Tried To Shift The Blame On To Me For Not Calling Them. But The Long And Short Of It Is The Paperwork Is Lost. Along With My Long Lost Old Chair. Remember That One.....went Out To Get Fixed And Never Returned. I Love This Loaner They Lent Me So I Didn't Complain. The Whole Thing Is Screwed Up & I Have To Go See The Dr. Waiting To Call Him This Morning To Say I Have Papers In Hand. The Owner & I Are Playing Let's Make A Deal As A Compromise For The Screwup. So I Am Off To Get Dressed. Hope We All Have A Great Day!! My phone interview on Saturday didn't go well. I knew it was going to be difficult as it's been roughly 4 years since I've used the programming languages they wanted, so I'd forgotten a lot. I told the recruiter that I didn't think I was a good fit for the position, but he wanted to submit me anyway. :dunno: I'm sure this afternoon's interview will be much better. On the way home, we stopped at the store and picked up groceries for dinner, which my roommate cooked. For my part, I let the dogs out, played with them and fed them - which was the much better end of the deal if you ask me. Next weekend, my roommate is part of a committee that's running a Holistic Health Expo, so she'll be at that all day Saturday. I'll go and check it out, but won't be there all day. I don't want to leave the doggies home alone that long. Happy - Bummer about the more snow. We got a dusting on Saturday. :tantrum: Glad you had a nice evening with dinner and the concert. If you do volunteer, I would suggest choosing something that you can do sitting down. Mel - So sorry about the chair hassles. Sending much positive energy your way today. :hug: And sending healing hugs to Jen. I hope her pain is less today from her fall. Laura - Good for you with all the exercise! Plank moves are very tough...although they don't look it. Brownies - Yummy! They are my all time favorite dessert. Shad - I hope your knee is getting better. I love the photos from your walk. Absolutely gorgeous! Ceejay - Good for you for going through your stuff. That was on my to do list this weekend, but I didn't get to it. Hopefully I'll have more time next weekend. Gotta get on with the work day. Good Morning Chicklets....2 days til Ho-ville. My weekend was productive. Got the house cleaned, laundry done, errands run on Saturday then yesterday painted both bathrooms at Cs house came home and cut the grass. I was in bed by 8 pm. Exhausted. I just don't have the stamina I used to, to get things done. HAPPY...we used to buy a salt block when we lived out in the sticks, it kept the deer busy and away from the other food we put out for the critters. We had this cute little baby buck one time that would stand by the salt block and stamp his foot at us, too cute. Of course there were a lot of deer with high blood pressure...lol. The theater sounded like a lot of fun. It is hard to find older theaters that are even open anymore....the one in Spencer, Indiana just reopened...the Tivoli and there is one in Plainfield, IN but don't know if it is open anymore. If you volunteer to do something there, pick something where you don't have to stand the entire time. Sit and drink boxed wine...haha. I used to watch Happy Day followed by Laverne & Shirley, remember both well, and can sing those for you also. CEEG....I watch Golden Girls all the time during the night when I cannot sleep. I just love them. Everytime the music starts, I keep thinking man they are all dead except Betty White...how sad is that? LAURA...good for you on the exercise...I wouldn't be able to move or walk the next day if I did all of that. I am not a chocolate or browning fan but I am sure C could help you out on eating them. He has a sweet tooth that just won't quit. We had to stop at Dairy Queen on the way home for working on his house to get him a strawberry sundae with whipped cream and pecans. A medium was almost 4 bucks. Good thing he doesn't do that often. I got the first season of MOTG and the first season of Doc Marting in the mail Saturday. We are into the 2nd disc of 3, season 3 of Downton Abbey. I am so hooked on that show. SHADDIE....hope the knee is feeling better. The swimming should help a lot. Docs say that water aerobics are the best thing for joints and arithis. THe pictures are lovely. Glad you had a good night out. That is it for me...gotta get busy, been here two hours and done nothing...well one lady, her daughter had her baby Friday nite. Girl, Emma Kate. So we were all ooooooing over the pictures. Oh LAURA....the shampooer is a Hoover Spin Scrub 50 with heated cleaning and a 10" cleaning path. It has attachments to do furniture or even smaller areas, stairs and such. Different brushes to do different types of cleaning. Hope this helps..
Annie - Thanks for the carpet shampoo machine info - I wasn't focused on a machine's ability to also clean upholstery, but that's a great feature. With no kids and the dog not allowed on our furniture, we only need light cleaning on our stuff anyway. I'd like to be able to do it ourselves and not have to pay someone else to do that. I love how you're so busy and accomplish so much on your weekends and then you say you don't have the stamina. :lol: You painted TWO bathrooms and cut the grass yesterday!!! You're putting me to shame, and bf, for that matter. We've kind of been on a home improvement strike lately, and it's not a good thing. Gotta light a fire under our butts!!! :flame: So this is the week of the big event!!!! You guys must be so excited to be tying the knot and then honeymooning. :) You deserve all the happiness in the world sistah! Is sissy caring for Sassy while you're gone?? Michelle - Glad you had a fun weekend. You've been so busy job hunting, you need to have some fun. :) It's been so long since I was in the job market, but what you said about the headhunter (wanting to submit you for the job in which you knew your skills were rusty), you brought back the memory of how very pushy they could be!! Don't let them keep throwing stuff against the wall to see what sticks - interviews are good, but not just anything. You don't have time to just waste!! Yeh, the plank moves are tough - my goal for this class is to be able to actually do all the plank moves when we get to them. Ceejay - How's the tablet? So portable, did you buy a cover for it?? Happy - Sounds like you had a nice dinner and performance on Saturday night. How often are there performances at that theater? If it's just the weekends, it sounds like it wouldn't be as physically demanding as the shop was. But I agree with the others - take the job with the least amount of standing. So what was the deal with "watch your purse"?? Must be an inside joke... You must be thoroughly sick and tired of snow by now, so sorry you're getting all this late season winter weather. :crossed: it doesn't last long. On the bright side, you're not missing any nice weather while you're busy working on your class assignments! :D When do these classes end anyway?? After my shower yesterday I went through several more files and got them relabeled and put away. Didn't empty an entire box though, darn it. Still, it's something. Got out in the yard with doggy and Preened the other garden beds. It warmed up nicely and the air even smelled good and springy. :) Bf and I went to lunch, then to the new Ross store by us. Pretty much like a Marshalls/TJ Maxx, but not as much volume of merchandise. I totally struck out in looking for dress slacks. In the meantime, bf was over in the men's section, but for some reason he found some kettlebells in the vicinity with the accessories. So now I have a 5 lb and a 7 lb kettlebell. The were really inexpensive and they're not nearly as nice as the ones we use in class, but they're just what I needed. After that was Walmart, and then back home for a dog walk. After that was tv, reading and relaxing. My glutes and upper body are sore today, some of which was from Saturday's class. No soreness in my quads, thank goodness!! !